Han and Angus pose with the portrait of the Queen – to think she’s Irish! Delighted to be on the list! Outdoor technical clothing, my favourite! It is telling that, in previous trips to Cape Pembroke, we’ve come across a small group of elephant seals and the occasional sea lion and none were to be seen this time around; Winter sees so much of the wildlife leave that only the gentoo penguins really stick around to be seen. Thankfully, our concerns about there not being much to see and do over Winter are so far proving unfounded. New experiences have been a consistent theme of our time here and that continued last weekend, but that’s a story for another day. To understand 1982 is to understand the Falkland Islands. Before proceeding, I will add a caveat to this most sensitive of topics: the following post is my own perspective, based on the notable limitations of what I have seen, heard and discussed. It cannot represent everyone’s thoughts, opinions and feelings but is only my personal experience of what 1982 means here. This week marks, not only half term, but the Falkland Islands Public Holiday of Liberation Day. 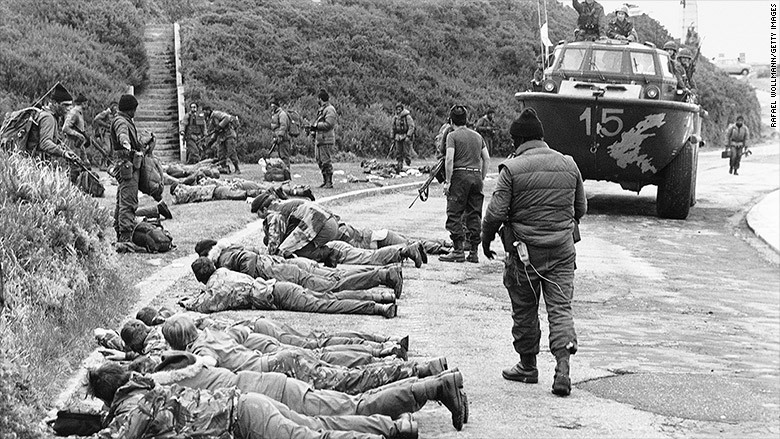 34 years have passed since the Argentine forces under General Menendez surrendered to British forces of Major General Jeremy Moore and an end to the formal occupation of the Islands by the military Junta of General Galtieri. It seems on opportune moment, then, to address the conflict and to try to convey the effect that it has had here on the Islands. As I discussed with a (local) colleague recently, were you to talk to people here you could be forgiven for believing that it had been just 4 years since the conflict, not 34. This is not just because of the amount of military paraphernalia that litters the countryside, but also the attitudes and discussions of the people here. The true extent of this has had me puzzled for some time but I have several theories as to the continuing level of the ongoing resentment held by Islanders toward those they see as responsible for their 74 day occupation. Granted, I haven’t been to many conflict zones and England’s lack of recent invasions doesn’t give me another home perspective but Europe has seen its fair share of wars in the last hundred years and I’ve studied enough conflicts to have an educated say on them. It is absolutely correct that history is remembered, of course, and it is understandable that the people here hold the conflict as part of their collective memory but even I was shocked by the extent to which this is true. It wouldn’t be an understatement to say that the Falklands have been defined by those 1,776 hours. For those in the rest of the World who perhaps barely acknowledged the conflict, this might be something of a mystery but there is deep, deep resentment toward those responsible for the conflict and toward the present day ‘Malvinistas’ (the short word for those who advocate the Argentine claim over the Islands). Sadly, there is also a more marginal but definite underlying racism directed at the Argentinians in general but this is, of course, not always true. Many people recognise that it is not the entire population of Argentina that caused/continue to cause the psychological upset but the all-too-familiar label of ‘Argie’ doesn’t clarify this distinction, especially given its usually-derogatory context.The ‘f*** off Argies’ sign adorning a local window has become something of a bone of contention, though thankfully many members of the community including students I teach acknowledge just how wrong this is to see. I and many other non-Islanders have been shocked by the level to which society here has been shaped by the conflict – the Islands exist in a sphere of ‘before, during and after’ and discussions of history, explanations of the status quo and many other aspects of life here fall into these categories. One local lady told me that the occupation had temporarily removed the identity of the Islands but I had to disagree; it has struck me that the invasion and subsequent liberation GAVE the Falklands its current identity. Still, though, it is hard to believe that a conflict lasting 74 days, costing the lives of just 3 local people (from British shelling) and 255 British servicemen (in comparison, current estimates for the Syria conflict stand at 470,000 casualties) could continue to have such an unending resonance. It is hard to convey in words the true extent of the conflict’s consequences here as I can’t know how that might be measured. PTSD levels, which are acknowledged by many as being very much present here, don’t seem to have been addressed or researched. The number of times it comes the conflict comes up in conversation or is used as an explanation for some aspect of life here is immeasurable and the physical scars have largely been eroded by time. This leaves an awareness that the conflict is essential to understanding life here, but no adequate way to explain why. The community here is small, amicable and historically linked. Many families here can trace their histories back 9 generations to the first British settlers and so it’s fair to sum up that ‘everyone knows everyone’. As a result, where some conflicts might only directly impact a small percentage of the population, 1982 would have affected not far short of 100% of the population here – each and every family would have come into contact with the soldiers in various ways (not always in any form of positive encounter as at Goose Green where the population were inexplicably interned in the Hall together and kept there with limited facilities, food and communication until their liberation whereupon many discovered that their houses had been ransacked and, shall we say, ‘dirtied’). Aside from some brutal murders in the early years of the Islands’ establishment, the Islands, like Britain, have not experienced violent invasion before. This is not to say that this is something one could ‘get used to’, but it goes some way to explaining why it stands out so much in the history of the nation. Lastly, and I personally consider this the dominating factor, is the ongoing political tension with Argentina. Historically, when conflicts end there can be some form of agreement and the nations or groups involved can look to move forward and hope to build closer relationships. Argentina’s claim to the Falkland Islands has been ingrained in their constitution and the various governments have sought to use differing approaches toward the islands to continue the conflict. Relationships are still extremely poor due to extremist thinking on both sides and most recently the de Kirchner government engaged in an aggressive stance toward the population here. This, in some ways, leaves a sense that the conflict still hasn’t truly ended as the issues continue and I believe this to be the key reason why 1982 remains in the fore. Perhaps, 20 or 30 years from now, a situation might come about that begins to build better relationships between the South American cousins and people here can begin to move on with their lives but that still seems a long way off. One day, I will give the historical background to the Argentine claim and the policies it has pursued but in the week of Liberation, that doesn’t seem to be the important thing right now. Self-determination continues and the thriving community on the Islands continue to provide a legacy for those that paid the ultimate price for the freedom of the people here. As a History teacher, I need to learn a lot of things. I’ve recently been teaching local history for a half term so that’s provided me with even more impetus to gain some wider knowledge of the history of these islands aside from my more specific 1982 conflict studies. The result of all of this is that I can answer a fair amount of questions that people might have about this place, so when a friend asked us to accompany him out to Camp to check out some old conflict sites, I figured I’d try to be of use. History teachers; never off duty! First stop was San Carlos, the site of the British landing on 21st May 1982. It’s hard to imagine how different the scenes here must have been 34 years ago as it earned its moniker of Bomb Alley – the videos of the low flying Argentine jets attacking the armada stationed here are haunting. I was surprised to see that many of the graves were unidentified. It always seems so much sadder. This is one of a number of ongoing issues about the conflict that I have yet to reconcile in my head and I will try to address soon. It is Liberation Day on Tuesday; a National Holiday here in the islands and sure to be a big celebration so expect some more historical updates soon (sorry). Remember, if there is anything you want to know about the Falklands, life here or anything you’d like us to blog about please just let us know. I won’t ALWAYS make it historical. Landing Day was highly celebrated with a service at the small graveyard but we arrived in time for a few drinks with the landowner. For the purposes of gathering sheep, culling the upland geese and for the inevitable farming mishaps many people out in Camp own rifles so Han and I had our first attempt at firing a .762mm. That’s another first chalked up to the Islands. Speaking of firsts, we also got invited to a drive from Moody Brook at the West end of Stanley Harbour, up Mount Tumbledown and then across to a nearby hill named Two Sisters. The only thing is, it’s Winter, Camp is very, very wet and there’s no road. So we put the Pajero through its paces, with a lot of help from a local friend who charged donations to a local cancer support charity in exchange for towing us out when needed. There is a noticeable 800kg difference between the old Hilux Surf and the new Pajero so we ended up needing three tows out by our local friend. Still, I’m learning a lot about off-roading and looking forward to some more trips. The restricted flights from South America cause the previously mentioned high cost of fresh fruit and vegetables. This has several side effects and one is the widespread gardening that occurs across town and Camp. There are more hours of daylight than the UK here but the predominant wind means that many a polytunnel adorns a Stanley garden. This has led to gardening, among other traditional hobbies, becoming a surprisingly competitive past-time. As many of you might have seen on the TV series ‘An Island Parish’, set here in the Falklands, one of the big events of the calendar is the annual Horticultural Show.I was lucky enough to receive a tall standing polytunnel for Christmas which I had placed in the garden but the wind soon saw to it that that didn’t stay together. With our pet sheep, Milo, having then gleefully eaten the one tomato plant we had going and our topsoil being all of a few inches deep we weren’t able to enter the gardening section but the baking category beckoned! This year I entered three categories in the baking: meringues, loaf cake and brownies. As I had only just arrived on the Islands at the time of the Show, my previously unknown name obviously caused a bit of curiosity as our entry into the raffle saw some comments of recognition at the new name in town. Small island life. The traditional past-times don’t stop there, however, as I have also joined the local Quilting club which, to my surprise, I have become very addicted to. There is a local haberdashery shop (Sew What) that is open on Saturdays which I have spent at least 2 and a half hours in on several occasions chatting to locals and discussing upcoming projects. I’ve also made my first quilt, that I’m extremely proud of but is on route to Ireland to my beautiful God-Daughter Rosie and I am looking at a slightly larger project to accommodate the cold Winter down here. Next up, we’ll be needing to get Milo shorn and I’ll be in touch with the Guild of Spinners and Weavers to see what we can do with his finest Merino fleece. Hopefully from sheep to…well, to be confirmed next season. Watch this space for quilting updates! I’ll try not to leave it so long until my next update this time and stop letting Bailey hog all the posts.